I agree with the other answers, but just wanted to say a bit more about the term "classical." It refers to a style that takes some of its ideals from ancient Greece and Rome, but was prevalent in the 18th century, after the Baroque period. Each style starts as a reaction to the previous style by getting simpler, sweeping away the conventions and complications of the last and returning to something more "genuine." Then, over time, it develops its own complications and is finally overturned by the next move to "get back to the basics." Baroque music may have started simple but developed into an amazingly complex style by 1750; the word "baroque" even today is used to describe anything that is highly ornamented, complicated, labyrinthine, and hard to understand. In music, the style was exemplified by the music of Bach, with its many-note melodic lines, many melodic lines running simultaneously, many ornaments, etc. 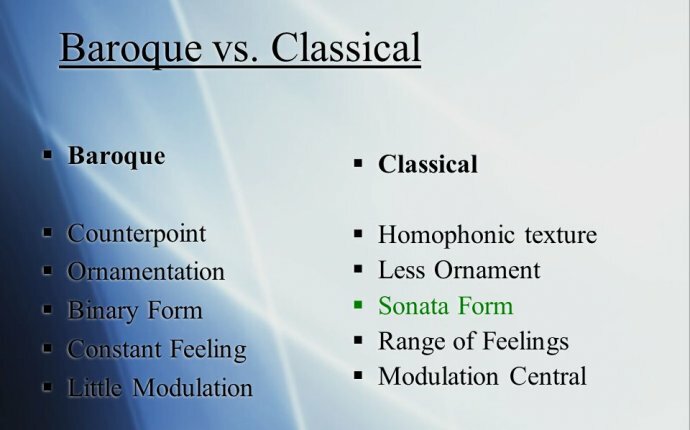 The classical style that replaced it in music emphasized simplicity and grace: a single melodic line with accompaniment, rather than several melodic lines running concurrently. It emphasized refinement, courtly manners, loveliness, maybe wit and humor, and required that emotion be expressed in a refined and beautiful way. Its greatest exemplar is Mozart. The "classical" clothing fashions of the time were supposedly based on the clothing of the ancient world, with the women wearing simple white gowns that vaguely resemble what ancient Greek women wore, etc. Over time, the classical style developed past its peak into something highly ornamented and artificial, and was swept aside by the Romantic movement, which in its "back to basics" philosophy was all about honesty, expressing what you really feel, and getting back to nature instead of writing for the court. The Romantic movement's ideas are still very much with us. Most people believe that it's a good thing to be honest about your emotions, to express what you as an individual really feel, to be sincere, etc., and believe at least in theory that your feelings trump everything else ("love is all you need"). And yet, I think the pendulum has swung back and we're more in a post-romantic, neo-classical time. Of music greats, the current darling of the masses is Mozart - a movie about him made him popular, and many, many people love his music (in my childhood, the comparably revered and popular figure was Beethoven). And the super-popular woman author of the moment is Jane Austen - every one of her novels has been made into a movie at least once (in my childhood, the Brontes were more beloved and every girl in my 8th grade class read Jane Eyre for fun, because it was a social requirement!). So in my lifetime, I've seen the shift from people preferring Romantic figures to preferring Classical ones. The Romantics are still revered, of course, but they don't seem to suit modern tastes quite as well. What I find really interesting is that the Classical artists are seen through a veil of romanticism. The Mozart so many people love is the tragic boy genius who wrote angelic music and died unappreciated (not the professional theater man with the vulgar sense of humor). The Jane Austen movies mostly make her stories into Disney-style romances about a girl marrying her true love, and miss the fact that her view of love was quite different from ours (to her, love is not all you need; you need money just as much). People today seem to prefer classical-style figures, but romanticize them! @Paimon: Call me pretentious for loving baroque and classical music I don't care, it's pure genius.